A long time ago, in a convention hall not so very far away, Apple introduced a product intended to revolutionize the living room viewing experience. It was one of the neatest things that most people had seen happen to the TV in a while, and there were a lot of people who were impressed by what it was capable of. It was loaded with all sorts of storage (a lot for the time, at least), and offered a novel way to get your media from your computer onto your TV. The sad thing is, it didn’t really take off the way other Apple products did. People liked it well enough, and it sold decently, but it wasn’t the hot ticket item that people were scrambling to pick up. That honor generally belongs to the iPhone, and now, iPad. 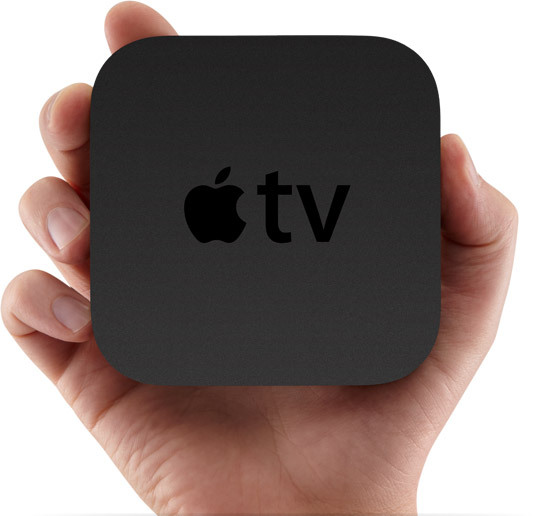 It was a little too pricey for what it offered, and most people probably felt like the Apple TV was a sideline player. Fast forward to September 2010, and we see a renewed focus to Apple’s efforts; their so-called “hobby” suddenly has a brand-new face, has lost a ton of weight, and can do basically the same stuff without all the baggage. More, actually. Some people still asked “Why?” but for $99, it was hard to argue against it. Those people (myself included), just went ahead and picked one up to find out what all the fuss was about. I can tell you right off the bat that I love my Apple TV, but not for the reasons one might expect. I don’t love it because it makes watching movies really enjoyable (it does) or because my family can see all the new pictures I just imported from my camera on the TV, or because I can stream that awesome YouTube video I’m watching right to the TV seamlessly. All those things are great, sure, but what really got me excited is what the little black box represents. Some folks have already jury-rigged a console experience into the iPad/iPhone/Apple TV. Even before that, however, before the 2nd generation Apple TV rolled out, there were reports that it would run some version of iOS. Ultimately, iOS under the hood really only exists in order to open the door to apps. With apps come developers, innovation (and, depending on the level of the APIs, usually some griping), and new software ecosystems. With iOS under the hood, we will eventually enjoy apps that talk to each other seamlessly, network invisibly, and build off of each other in synergy. That’s what got me excited. So, basically what I just said. The key here is that Apple would be competing against veritable giants in this space, companies that have years and years of experience creating behemoth machines that are designed for lifespans that fill the better part of a decade. These consoles are powerful, multi-role devices that have also taken on increasing cultural significance as gaming moves more and more into mainstream culture. Contrast that to Apple’s predictable and consistent release cycle, which, on the one hand, allows them to react quickly to shifts in the marketplace but, on the other hand, sometimes leaves customers feeling alienated. While I tend to side more with the stability and development cycle that is characteristic of current-gen consoles, Apple’s move into this space may also spur more innovation and force the current trifecta (Sony, Nintendo, and Microsoft) to think of things that Apple hasn’t. Sony’s current offerings (PS3, PSP) are great, but lack synergy. If there’s anything that Apple can nail, it’s synergy, and those big three will have to work hard to integrate their home consoles with other services and devices if they want to offer the consumer some more value. Developers’ successes in the phone space have translated smoothly from the mobile to living room space (see Angry Birds and Dungeon Hunter), and Apple sees itself uniquely positioned to make use of that transition. Think about it: if a developer crafts a successful, top-selling title for iOS, Apple wants to make sure that the player who wants to enjoy that same experience in their living room with three of their friends can do just that. Apple doesn’t want that developer transitioning to another platform. Apple doesn’t want people spending their money on other people’s hardware, either. Why buy the PS4 or XBox 720, four controllers, and whatever other magic peripherals they have for the primary purpose of playing games when instead a person can purchase an Apple TV and iOS devices for the whole family, and be simultaneously purchasing a game console and input devices? Let’s take it a step further. Ever heard of OnLive? Ever seen their game console? Does that seem familiar to you? OnLive’s servers stream games from the cloud to your TV. You can play super high-quality games over a broadband connection. Apple just built a mammoth data center, purportedly for iTunes and MobileMe. Let’s think a little further, here. Apple is also focused more on social now than they ever were, and it also wouldn’t seem too far-fetched to use Apple’s newly-introduced Game Center to pull all their iOS users together into a platform not unlike PSN or XBox Live. Add to that all the success that more casual titles have seen, and it seems elementary that Apple would take steps in this direction. I don’t know what gaming in Apple’s ecosystem will look or feel like, but I have a strong suspicion that the war for the living room is just heating up.